Over the last couple of decades, slate flooring has become an increasingly more popular choice in the U.S. When slate first started to be used in homes and businesses for flooring, the varieties of slate that were very limited. In the beginning, there was essentially just gray and pale to choose from. Nowadays, there are hundreds of slate colors. This has been a huge factor in the increased popularity of this material for flooring. Unfortunately, too often home and business owners who have decided to go with slate flooring find that the upkeep involved differs from their usual floor choices. The good news with slate flooring is, unlike wood and other natural stone materials, the actual care and maintenance is not too complicated. In fact, the main source of problems for slate flooring is just caused by neglect. This is much easier to work with than say flooring with lots of vulnerabilities and sensitivities. Dust-mopping: By far one of the most important treatments you can do on your own to maintain your slate flooring is dust-mopping. Dust, dirt and grit are the main source of issue for the surface of your slate flooring. When left on your flooring, the material can easily become scratched and marred. Slate floors that are dust-mopped often, stay cleaner and maintain their gorgeous shinie for longer periods of time. For the best results, you will want to dust mop your slate floors daily. Whenever the foot traffic is high, or the flooring is located in a commercial building, this will need to be done several times a day. Also it is important to keep in mind that you do not want to use an oil-treated dust mop on your gorgeous slate flooring. When dust mopping technique matters! You will want to run your clean dust mop in one consistent direction only. Avoid moving it back and forth, because this will lead to grinding the sediment and grime into your flooring. When you stay consistent and push in one direction you are able to move the debris in a low impact method. When you have accumulated enough dirt and grime into a pile, pick it up with a dustpan and brush and take the dust mop outside to shake any remaining dust. When storing the dust mop, be sure to keep its head off the ground. Hardware stores sell various hangers, which are excellent for storing mops and brooms. Damp or wet mopping — All slate flooring needs to be cleaned. How often you will need to damp or wet mop will depend on the amount of traffic and the finish on your flooring. In a home, once a week should be an appropriate level of frequency for damp mopping. Once you move into a commercial setting you will need to clean your floors twice a week, to everyday. For everything else, Modern Stone Care is here for you! 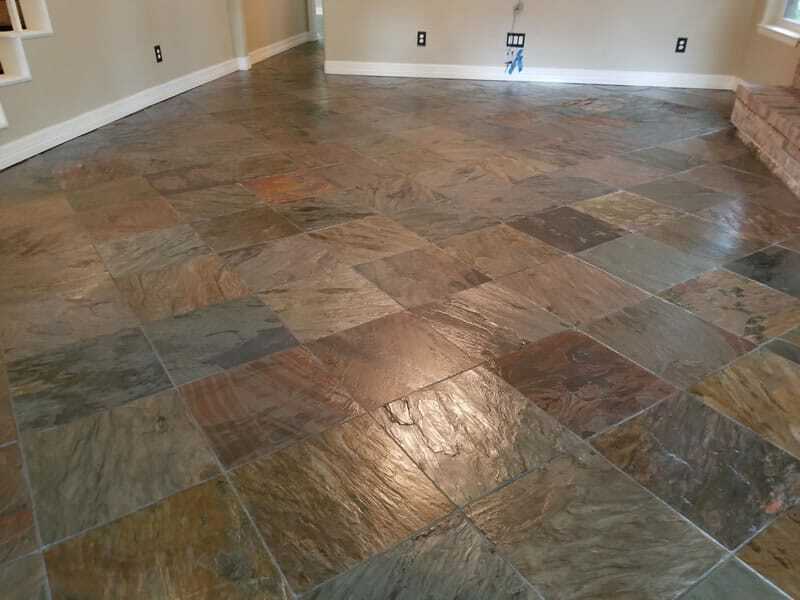 We clean, restore, and finish your slate flooring! Whenever you need to have your marble floors and surfaces serviced, contact the Greater Houston area experts! Modern Stone Care proudly serves The Greater Houston Area, including but not limited to, Atascocita, Bellaire, Clear Lake, Cypress, Friendswood, Houston Heights, Houston, Humble, Katy, Kemah, League City, Kingwood, Memorial, Missouri City, Montgomery County, Spring, Spring Branch, Stafford, Sugar Land, Tomball and The Woodlands.